Pre-election polls had given opposition frontrunner Martin Fayulu, a respected former business executive, a healthy lead. Riot police were earlier deployed to protect election officials in the DRC as it braced for the announcement of the results of the presidential vote held 11 days ago. Security forces took up positions outside the offices of the DRC’s election commission and elsewhere in the capital, Kinshasa, amid fears that violence would mar the first electoral transfer of power in 59 years of independence, AFP reports. Fayulu’s supporters believe outgoing President Joseph Kabila plotted to rig the vote in favour of his hand-picked candidate, Emmanuel Ramazani Shadary, or do a power-sharing deal with Tshisekedi, head of the DRC’s main opposition party. 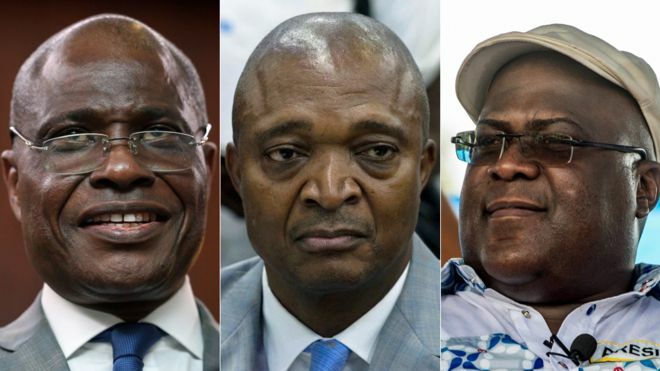 Vote tallies compiled by the DRC’s Catholic church found Fayulu clearly won the election, two diplomats told Reuters, raising the spectre of a standoff that many fear could lead to violence. Lambert Mende, the communications minister, fuelled fears of disorder by telling reporters on Wednesday that there was “a time to oppose each other and fight an election but also [a time] to unite” when asked about a possible government pact with Tshisekedi. Optimists hope the election, which passed off mostly peacefully, could chart a road to a better future, but any widespread perception of electoral fraud could set off a destabilising cycle of unrest, repeating violence that followed elections in 2006 and 2011. “If the [election commission] announces the true results of the ballot boxes it will be calm but if not, I don’t know what will happen,” said another Kinshasa resident, Abraham Tumba. The internet has been cut off for more than a week to preserve “public order” and security agencies were on alert across the country. “Everyone … voted against the government in place. We are preparing fully to demand victory if it is stolen from us,” said Augustin Bujiriri, 25, a student in the eastern city of Goma. Kabila’s second electoral mandate expired in 2016 and he only reluctantly called new elections under pressure from regional powers. The constitution forbade him from standing again and critics claimed he hoped to rule through Shadary, who has no political base of his own. The Roman Catholic church is a powerful institution in this devout country, and in a joint declaration with a group of Protestant churches and election observer mission Symocel, the Catholic bishops’ conference called for calm and demanded that the DRC’s election board, CENI, publish “only results that come from the ballot box”. Tshisekedi’s camp earlier said it expected to win and had met with Kabila’s representatives to ensure a peaceful transfer of power. 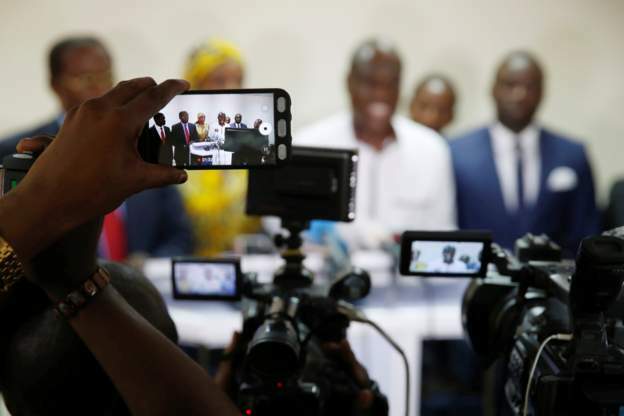 On Tuesday, Fayulu and six other presidential candidates issued a statement saying that the results “cannot be negotiated”. Domestic election observers say they witnessed serious irregularities on election day and during vote tallying, although a regional observer mission said the election went “relatively well”. Kabila has ruled since the 2001 assassination of his father, Laurent Kabila, who overthrew long-serving dictator Mobutu Sese Seko in 1997. Whoever takes power via the ballot box would be the first to do so since prime minister Patrice Lumumba was toppled in a coup less than three months after the DRC won its independence from Belgium in 1960. Lumumba was killed four months later.